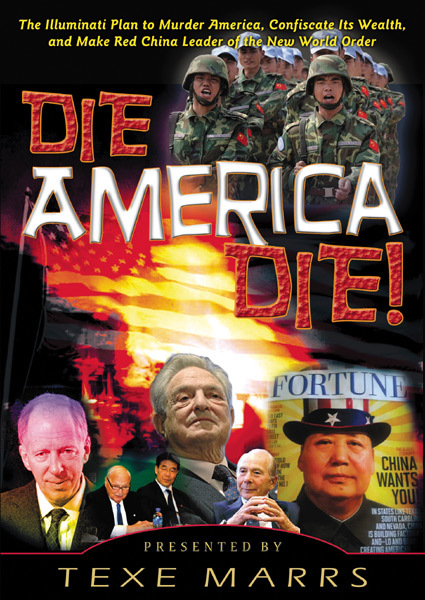 Power of Prophecy: (DVD) Die America Die—The Illuminati Plan to Murder America, Confiscate Its Wealth, and Make Red..
(DVD) Die America Die—The Illuminati Plan to Murder America, Confiscate Its Wealth, and Make Red..
Texe Marrs’ Newest Video Documentary! The economic misery index is at an all-time high. Millions of Americans are out of work with few prospects. Protesters and demonstrators occupy our streets demanding the politicians do something—anything—to fix America’s grave financial condition. But political gridlock prevails and, in fact, there is really no difference between the Republican Party and the Democrats. Incompetence, graft, corruption, and scandal are found everywhere. America seems to be sinking into a hell-hole of defeat, and a final economic cataclysmic event may soon be at hand. But is this breaking of America’s back a planned series of fiascoes? Is there an elitist group, backed by the Money Power, including the Federal Reserve, the White House and corporate banking interests, overseeing this destructive process? Indeed, is Red China, their perfect “Communist Ideal,” set to rise as the leader of the New World Order? Will the U.S. be leveled and the dollar decimated to benefit the communist tyrants in Beijing? Can we stop this foul plan of the elite and make America great once again?